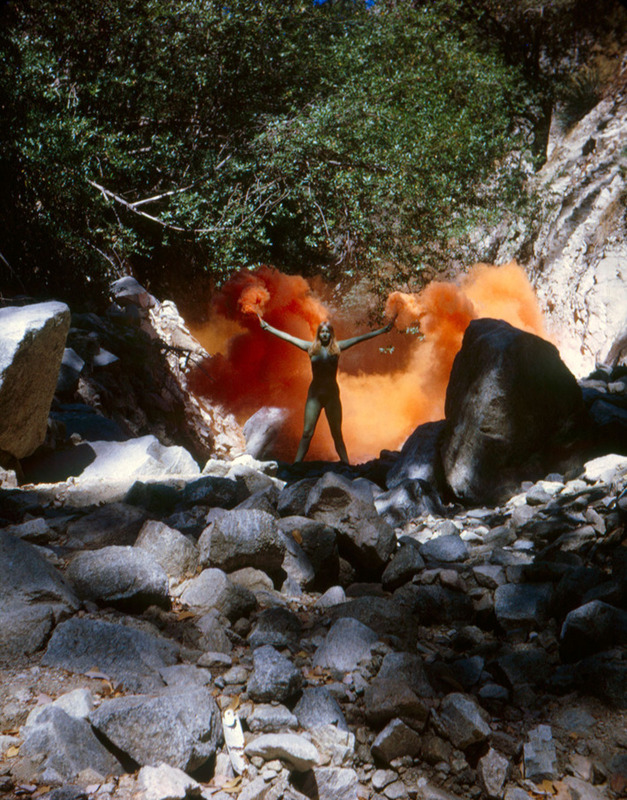 In 1968, when she began her pyrotechnic “Atmospheres” series in Pasadena, California, joking that she’d lit the Pasadena Art Museum on fire in protest of its patriarchal curatorial preferences, Judy Gerowitz was well on the way to becoming Judy Chicago. 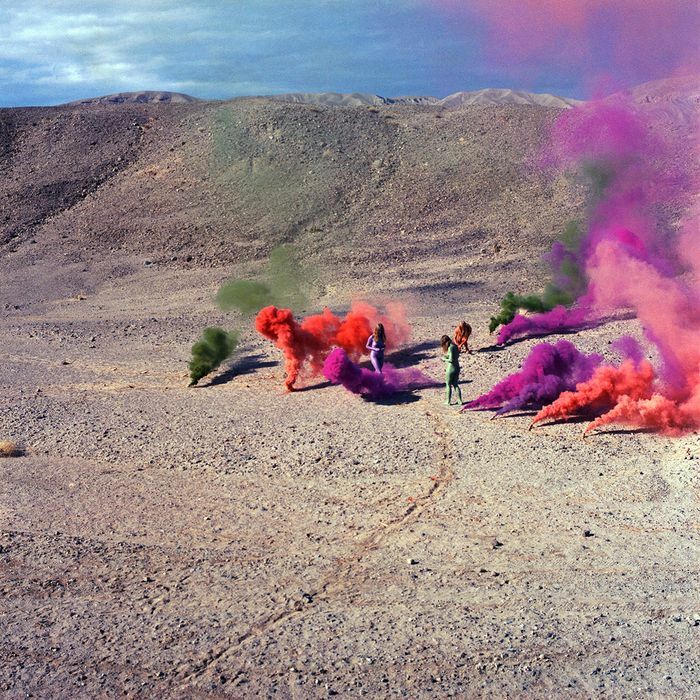 That famous public declaration: “Judy Gerowitz hereby divests herself of all names imposed upon her through male social dominance and chooses her own name, Judy Chicago” was made in Artforum’s October 1970 issue. Chicago established the first feminist art programs at California State University–Fresno and CalArts, and then left academia to pursue her own work in 1974, the same year she stopped making “Atmospheres.” To this day, she is probably best-known for The Dinner Party (1979), a diamond-shaped table set with 39 place settings for, and each evocative of, accomplished women, including Virginia Woolf, Sojourner Truth, Hypatia and Georgia O’Keeffe. It’s on permanent display at the Brooklyn Museum. The idea for the “Atmospheres” pieces, which she staged for the next six years, and revisited again beginning in 2012, was itself a feminist act. And it involved working with fireworks and smoke bombs and other fun pyrotechnics she’d learned how to use. These photographs documenting “Atmospheres” are on view at Nina Johnson gallery in Miami. The Institute of Contemporary Art, Miami’s “Judy Chicago: A Reckoning” opens December 4. The narrative of landscape and land art had been dominated by men. “Atmospheres” came from the desire to insert a feminine perspective into the conversation and to soften and feminize the environment. When you were doing it, what was the reaction of the people around you? Creating these works produces a spectacular visual effect: awe, fear, inspiration, this on top of the collective energy that comes from producing a work of this scale with a group of participants. When I began in the late 1960s, there were few government regulations, so my friends and I just went out into the landscape. Everybody participated by lighting flares, taking pictures or bringing food, as they were often long days. Everyone loved it though there was not a lot of understanding about what I was doing and how subversive it was. Looking back, did it accomplish what you thought it would accomplish? It’s still doing so, not only by exhibiting the documentation of the works created in the ’60s and ’70s but also through the newly commissioned performances, such as the forthcoming event at the ICA Miami. 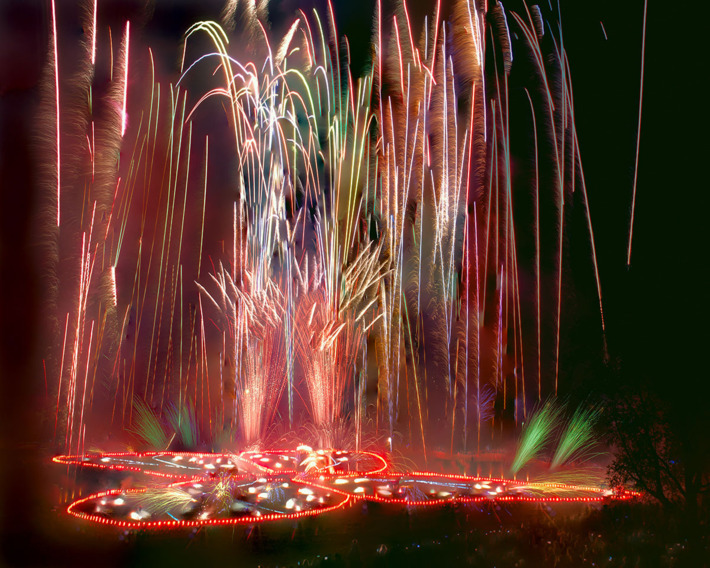 I did fireworks from 1968–1974, and the pieces became increasingly large in scale as, from the beginning of my career, I was very ambitious. For two reasons: an inability to get increased financial support and also sexual harassment from the head of the fireworks company where I was apprenticing to be a pyrotechnician, which was the only path at a time when there were no female pyrotechnicians. In 2012, thanks to the Getty Performance Festival, part of Pacific Standard Time. I was able to pick up where I left off in both fireworks and dry ice. Since that time, I have done five major new pieces. In February 2019, I will do the sixth, at ICA: A Purple Poem for Miami. I can’t wait.